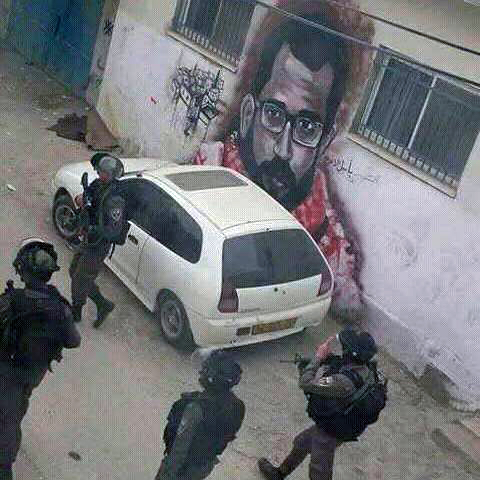 Israeli occupation forces walk past a mural of Basil al-Araj in al-Aroub refugee camp near Hebron. Shortly after arriving in Palestine in 2012, a comrade invited me to a demonstration in front of al-Muqata’a in Ramallah, the seat of the Palestinian Authority in the occupied West Bank. It was a significant symbolic event, being the first protest against the PA directly in front of its headquarters with about 100 people holding signs on the sidewalk condemning PA President Mahmoud Abbas’ decision to hold negotiations with Israel. Nothing much happened, but that nothing much clearly irritated the PA. Following the protest, several people met at a nearby café. That was the first time I met Basil al-Araj. Similarly, nothing much happened, but the more time I spent in Palestine, the more and more frequently I found myself in Basil’s company. He spoke passable English, and aside from translations by others, that was how we communicated given that I embarrassingly managed to live there for more than a year and not learn Arabic.